Umesto planiranog skupa protiv rata i predsednika Putina, koji je trebalo da predvodi 55-godišnji opozicioni lider, u centru Moskve okupili se građani da odaju poštu ubijenom Borisu Nemcovu - kako ga je predsednik Obama nazvao - "neumornom borcu" za prava ruskog naroda..
1 Opposition leader and Russia's former Prime Minister Mikhail Kasyanov, right, speaks to the media with opposition activist Ilya Yashin, left, during a march to commemorate Kremlin critic Boris Nemtsov, who was shot dead Friday, in Moscow, March 1, 2015. 2 People carry a huge banner reading "Those bullets for everyone of us, heroes never die!" 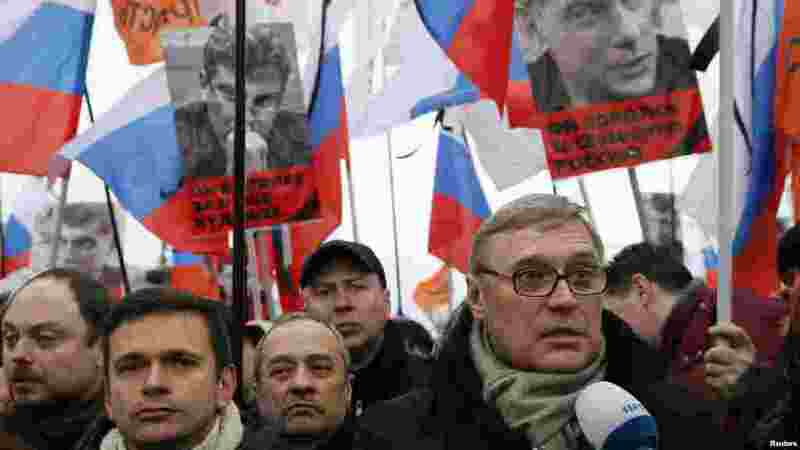 as they march in memory of opposition leader Boris Nemtsov who was gunned down on Friday near the Kremlin, in Moscow, Russia, March 1, 2015. 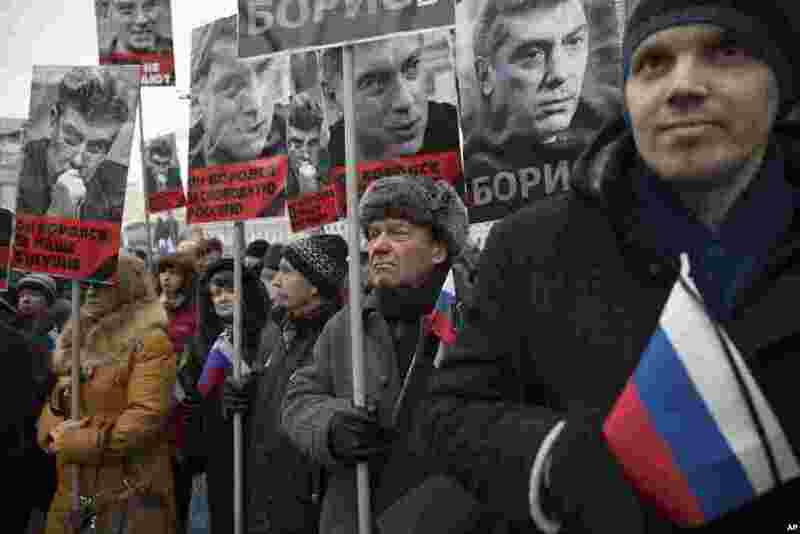 3 People carry portraits of opposition leader Boris Nemtsov, who was gunned down on Friday near the Kremlin, with words reading "He fought for a free of Russia, He fought for our future!" 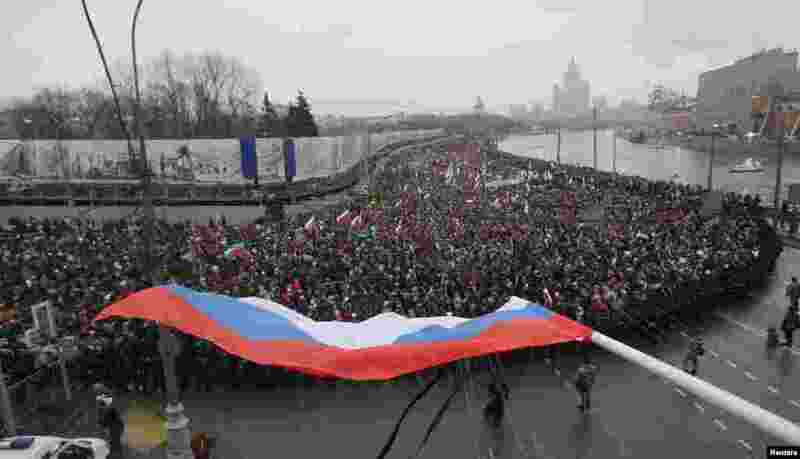 in Moscow, Russia, March 1, 2015. 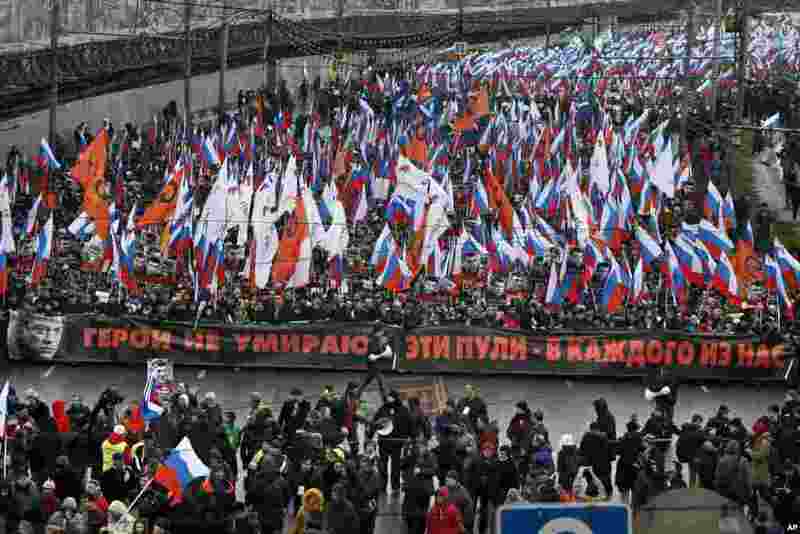 4 The Russian national flag is pictured during a march to commemorate Kremlin critic Boris Nemtsov, who was shot dead on Friday, in Moscow, March 1, 2015.